The Spanish government has ruled out telling the public prosecutor to reduce the charges against Catalan pro-independence leaders, including violent rebellion — an offence for which nine politicians and activists are currently held behind bars while awaiting trial. Following Germany’s decision to reject the extradition of former Catalan president Carles Puigdemont for the crime of rebellion, lawyers of exiled and imprisoned leaders said it was an ‘opportunity’ for Spain’s prosecutor to rectify and drop the accusations. 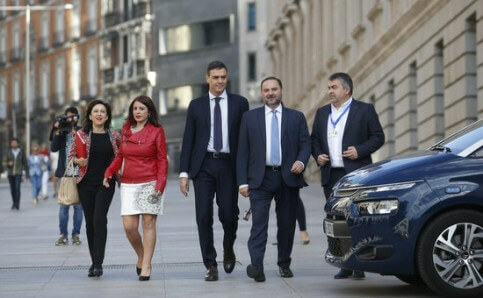 Spain’s PM, Pedro Sánchez (centre) accompanied by socialist colleagues (ACN). Catalonia’s vice president Pere Aragonès urged the new Spanish government to use ‘the tools at its disposal’ to free the imprisoned leaders — although they will be tried at the Supreme Court, the charges they face were originally put forward by the prosecutor, which is appointed by the government in Madrid. Under Spanish criminal law, rebellion applies to those who ‘violently and publicly’ try to ‘abrogate, suspend or modify the Constitution, either totally or partially’ or ‘declare the independence of part of the national territory’. The crime of rebellion carries prison sentences of up to 30 years, and has been widely contested by pro-independence supporters. While the charges of rebellion were rejected by the German court of , a European Arrest Warrant for Puigdemont was accepted for the crime of misuse of public funds. The Supreme Court has yet to announce whether or not it will accept the extradition — if it does, the former president will only be judged for misuse of public funds. Spain’s attorney general is currently María José Segarra, a member of the progressive union of public prosecutors, just like the new justice minister, Dolores Delgado.